This is New York, and this is the biggest event of the summer. Good match. Jericho and Owens worked well together, and their personalities were even more apparent in the match than Enzo and Cass’. There were a couple of double team moves that didn’t look they went exactly as planned (including the finish), but they both got enough of them to make them work. Other than that, this was a solid match. Shane McMahon and Daniel Bryan run into Mick Foley in the back. As they’re talking, Jon Stewart shows up and questions Foley for working with Stephanie McMahon (who is right behind him). Steph asks Jon, “what good is power if you can’t abuse it?” New Day (Kofi & Xavier) walks by. They say there is no need for tension. They then borrow Jon Stewart. Very good match. There was an ugly fall early in the match, but it lead to a main factor in how the rest of the match played out. This was a very physical match with both competitors hitting and taking some tough-looking moves. It had a nice flow to it, and I really liked the finish. It helps to maintain interest in the title and the feud. Their match on RAW from a few weeks ago was a lot better though. Doctors Gallows and Anderson are joined by AJ Styles. They talk about beating up John Cena when Finn Balor walks up. The Club holds up their hands for a “Too Sweet,” but Balor just smiles and walks away. Pretty good match. Crews showed some impressive strength and agility, and The Miz showed some decent heel tricks, but otherwise this probably could have been a fine regular TV match. Great match. They threw everything they had at each other, and even came out with a few new things. It turned into one big move after another, but not in a bad way. There were some nice counters as well, including a very nice sequence of reversals in the second half of the match. This match was worth the buildup over the last few months. It cemented Styles’ place in the company, and it added an interesting new layer to Cena’s character. Two fans go behind the scenes at Summer Slam. Jon Stewart heads to the ring. He is glad that no one interfered in the previous match. He also says that he will be joining New Day in the next match. This was a fun match and was a good follow-up to the seriousness of Cena versus Styles. The match itself was fine, then Jon Stewart got involved. I liked his bit, and it led directly to the finish. This match didn’t solve anything, but it set up the next chapter in the feud and helped to keep us from having a less than satisfying conclusion to this match since New Day wasn’t at full power. Buildup for Ambrose versus Ziggler. Good match. Ziggler out-wrestled Ambrose, but Ambrose’s odd style allowed him to stick around. The match was entertaining, but I don’t know that it lived up to Ziggler’s good promos from SmackDown. Regardless of the outcomes, I think putting over Ziggler’s fight and passion a bit more would have helped the match be better. As it stands, Ambrose didn’t really have to do anything different than he normally does in this match. 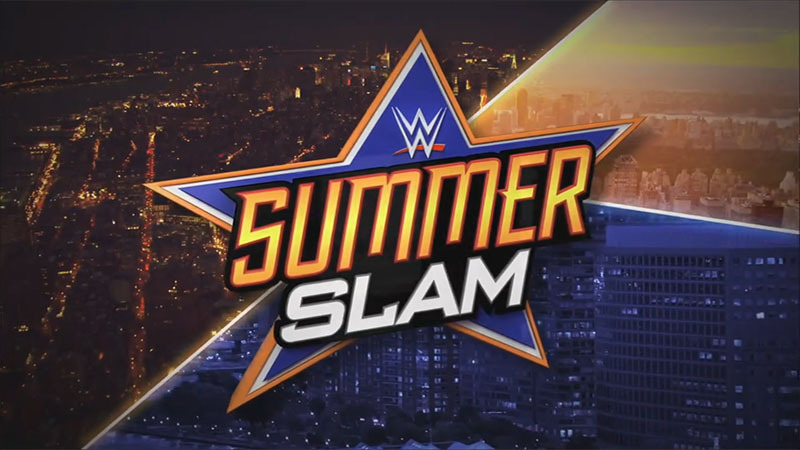 WWE Superstars took over New York during Summer Slam week. Pretty good match. Not every move looked great, and the veterans clearly outshined the newer superstars, but this was entertaining. I think Becky looked the best, and Carmella probably looked the least so. I liked the replacement for Eva Marie in the match, though she was the obvious choice. Maria Menounos welcomes Rusev and Lana. Rusev does not like to hear Roman Reigns’ little name. Lana says that people like Maria no nothing of true love. Buildup for Balor versus Rollins. Very good match. Both guys pulled out moves that they haven’t done in a while. This match had a good build to it as well as some exciting moves and moments. I liked how both guys kept trying to hit their big moves but they kept getting avoided or countered (or kicked out of). Hopefully this is the true start to a long feud. Renee Young, Lita, Booker T, and Jerry Lawler talk about their favorite moments from the show so far. Dolph Ziggler dresses up as Colonel Sanders to confront The Miz in a chicken suit. For KFC. Lana introduces Rusev for the next match, and Roman Reigns comes out next. As Reigns enters the ring, Rusev immediately attacks him. Rusev throws Reigns around on the outside and smashes him with the ring steps, but Reigns eventually gains the advantage. Reigns beats up Rusev and leaves him lying on the floor. Needless to say, the US Title Match does not take place. As it looks like the segment is about to end, Reigns comes back out to the ring area and spears Rusev. Rusev was already selling an injury to his midsection, and after the spear Rusev looked to be in major pain. Lesnar and Orton, fifteen years in the making. A pretty good match, but it seemed to be more about story and character than the match itself. It was a fairly brutal match, and Orton got busted open, but I was calling each spot in my own head before they happened. So it wasn’t surprising at all, but it was interesting in what it does for both men, and for the relationship between RAW and SmackDown. After the match, Shane McMahon enters the ring to try to attend to Orton. Lesnar won’t let him pass and hits an F5 on Shane. Heyman freaks out. I liked the show as a whole, though I was hoping for more. I think some matches were in some odd places (namely both women’s matches and the US Title match), but that wasn’t too big of a deal. There were some really good matches and some regular TV quality matches, but none that were really bad. I think the hype for the show made some of the matches seem worse by comparison since they didn’t all live up to the buildup. I also think that four hours plus a kickoff show is too long. Or at least it can be if all the matches aren’t fantastic, which they weren’t. The crowd died at times. Pretty badly. Especially around the time of the World Title match and the women’s tag match. Those matches weren’t bad, but the crowd was not into either one. It affected the matches even for people watching at home. The show did make some interesting developments in continuing feuds, but I think it also had some moments that could end feuds if they want to. My favorite moments were probably the Styles/Cena match, the result of the Women’s and Universal Title matches, Big E’s return, and Orton getting beat up. Probably in that order too. Jeri-KO vs Enzo and Cass: I like the team of Jericho and Owens, they’re funny and fun to watch, but this feels like it’s going nowhere. The match felt like a last-minute way to get all of these guys onto Summer Slam because they didn’t have anything else for them. This match didn’t mean much of anything to me other than an excuse to see some funny backstage interviews and to watch Owens ham it up in the ring. A lot of the feuds on this show developed after the draft, so the last-minute feeling is something that popped up a lot tonight. Women’s Title Match: Like I said above, the match they had on RAW was better and more emotional. I’m okay with the finish though. I actually like it. I really wanted Charlotte to lose the title before because I thought her title run had gotten very stale, but since she’s been forced to have matches on her own my interest has renewed. Charlotte winning the title back quickly helps to solidify her status as a worthy champion, and that helps solidify the title as something worth winning. This could turn into an amazing feud, where if Sasha just won and moved on it might feel like Charlotte’s first reign didn’t mean as much (and Sasha’s first title win didn’t mean much either). IC Title Match: This really could have been on SmackDown and it still might not have gotten Match of the Night. I didn’t expect much from this match though, so I wasn’t let down. Crews is impressive, but they’ve yet to make me really care about whether or not he wins (or whether The Miz loses). And being an impressive athlete doesn’t mean you can put together an intriguing match. I like the direction they’re going with Crews using Daniel Bryan calling him “Creed” as a matter of disrespect. Crews literally has to make a name for himself. I just think there wasn’t enough time spent on this feud to make anyone really care yet. That being the case, I’m fine with Miz winning. Maybe they’ll continue to develop the story, but I’d be okay if they didn’t. Styles vs Cena: I couldn’t have asked for a better outcome to this one. The match was great and exciting, and Styles going over cleanly, after kicking out of a second-rope Attitude Adjustment, helps make him a the top guy we knew he always was. Hopefully they’ll use this momentum wisely. Tag Title Match: This was another match that could have been on one of the weekly shows and still have gotten beaten for Match of the Night. The buildup made sense for how the match ended (Big E got injured, Gallows and Anderson made fun of it, Big E came back), but I wish this didn’t have to happen at Summer Slam. I think this was another match hurt by a quick buildup to the feud since the draft was so recent, especially since they can only develop feuds on a single show per week now. Still, I’m not mad at the result of the match for the reasons stated above. World Title Match: This one felt like it should have been more intense, but I think Ambrose’s style is almost always going to make that intensity difficult. Also, a big part of Ambrose’s appeal is the likability of his character, but he was kind of a jerk in this (again, brief) feud. Ziggler cut the best promos leading up to this match, but the intensity he had in those was not matched by the work in the ring. It was a fine match, but it should have been better. This would have been a very good SmackDown main event. I’m not mad at the outcome though. I didn’t really expect Ziggler to win, and this loss can actually help his character. Even if he moves on to something else, this loss can help build a bigger fire within him. I’d like to see him go after The Miz (as I explain above in the KFC commercial segment). I think Ziggler and Ambrose both need to move away from this feud for now. 6 Woman Tag Match: Like the opening match, this felt like it was thrown together. The whole women’s division on SmackDown feels thrown-together. Are they just buying time until the announcement of a second women’s title? As far as the match itself, it was fine, but it was far from great. Another TV quality match. But I didn’t care about the outcome at all. That’s a problem. They need to start making some real feuds here, or the ladies on SmackDown are going to always feel like they’re second to RAW. Also, it probably shouldn’t have been so late in the card. The Women’s Title match probably should have been here. Universal Title Match: I’m not a fan of the belt or the idea behind the title, but this was a good match. If they keep outdoing the World Title with matches like this, then the Universal Title will be entertaining, even if it still doesn’t mean a whole lot. US Title Match: Yeah, it didn’t happen, but as a I explained above, I’m kind of okay with that. This was another instance where it’s unfortunate that this happened on Summer Slam, but I’m fine with the segment in principle. I really think it should have been a lot earlier in the show though. This probably should have happened after Styles/Cena. It would have been a nice buffer for the next actual match, and it would have made more sense from an realistic show structure. I mean, what possible real reason could they have for putting the US Title over the World and Universal Titles? There is no reason. This was a horrible spot on the show for this. Especially considering what happened in the next match. Lesnar vs Orton: As I said above, the match itself was entirely predictable to the point where I was calling the spots in my head. But I think the entire point of this “match” was the beatdown. It had to be brutal, so that’s why they allowed Lesnar to bust Orton open. Looking at various comment sections people seem to be divided on whether or not this was supposed to be part of the match, but come on. Of course it was. All of Lesnar’s shots to Orton were completely safe. Orton was covering up, and Lesnar was striking with a large part of his forearms and hands onto Orton’s hands. Then Orton drops his hands and Lesnar delivers two elbows to Orton’s head. It looked like the second one opened him up, and that’s when Orton covered back up and Lesnar went back to safe blows, this time hitting Orton mostly on the arms and even his back and shoulders. The fact that Orton dropped his hands and that Lesnar only delivered enough elbows to draw blood (and was otherwise completely safe) tells me that this all played out like they wanted it to. I see people calling for Lesnar to be fired for being unsafe and trying to hurt Orton. If Lesnar wanted to hurt Orton he could have. Badly. A number of times. All the suplexes he delivered were low and safe. The blows at the end of the match were safe. Lesnar is probably tough to wrestle because of his strength and has been accused of being unsafe, but I didn’t really see that tonight. I actually like the outcome of this. For one thing, I like seeing Orton get beat up. For another, there was no feud going into this match. Nothing. Each man invading the other’s show is not a good feud buildup. Saying that they’ve never faced each other is not a good feud buildup. This is actually the start to what could be a good feud. This doesn’t bury Orton because no one really cares if he loses. He’s been around and in the top tier too long for that to hurt him. And it wouldn’t really be very believable if Lesnar, the guy that can beat anyone and everyone, even The Undertaker, lost to a guy returning from an injury. Considering the schedules of the guy involved, they could stretch this out to Wrestlemania. But in order to do that, this match had to look brutal. It did. But I do think placing the US Title beating right before this hurt the show. The segments were too similar, and having two unsatisfying segments to conclude a four-plus hour show was a terrible idea. Despite not being for a title, I think this was the most satisfying match. It had the longest and best buildup, and the match itself was probably the most exciting.